This post has been written in collaboration with Magimix, but all thoughts are my own. Blogger dreams do come true. 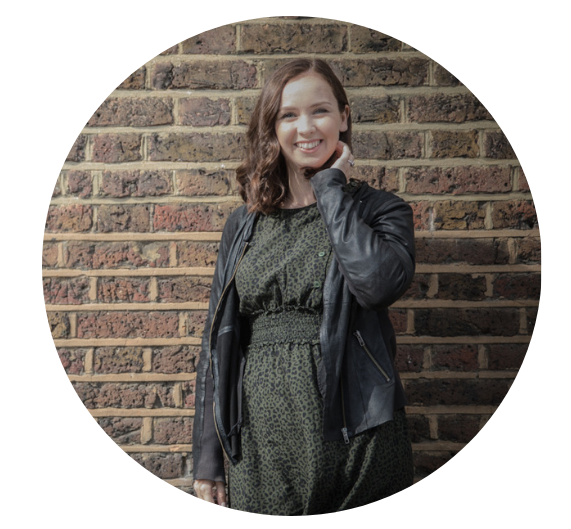 If you'd told me when I started my blog that Magimix would get in touch to see if I would make them a recipe for their website I'd have said it would never be possible. But guess what.... they did! I've never owned my own food processor. Every single thing you see to-date that I have made on this blog and on my Instagram account has been lovingly (sometimes forcibly with a lot of elbow grease!) made using my own fair hands, a Nutribullet and a hand / stick blender for anything that needed blitzing. A serious blender or food processor is real investment and something that I've not really felt able to afford yet. I'm also a total pain in the arse at deciding what I want and will inevitably spend a lot of time doing research only to decide the one I really want is way out of financial reach and decide I don't want to settle for second best! So when Magimix approached me I knew I was in for a treat. Their products are the gold standard of blenders and I was so excited at all the possible recipes I could now create with their powerful gadgets and with a decent size jug to make proper portions! When deciding what recipe to create for Magimix I immediately ruled out smoothies or soups. They're pretty obvious things to make with a blender. Smoothies aren't something I have on a daily basis and soup just couldn't be more wrong for this time of year, particularly 2018 when we're enjoying a blistering summer! So in typical Vicky fashion this had to be a savoury dish. And pesto sprang to mind because it's something that really needs a powerful blender to make into the right consistency. This particular pesto recipe has been in the back of my mind to make for a while now, since I attended the Arla Fibre launch back in April (which I wrote about here). During the lunch we learnt about simple swaps in our diet that we could be making to increase our fibre intake. In the UK the recommendation for adults is 30g of fibre a day to support balanced digestion, but most of us are only hitting 17g a day on average. 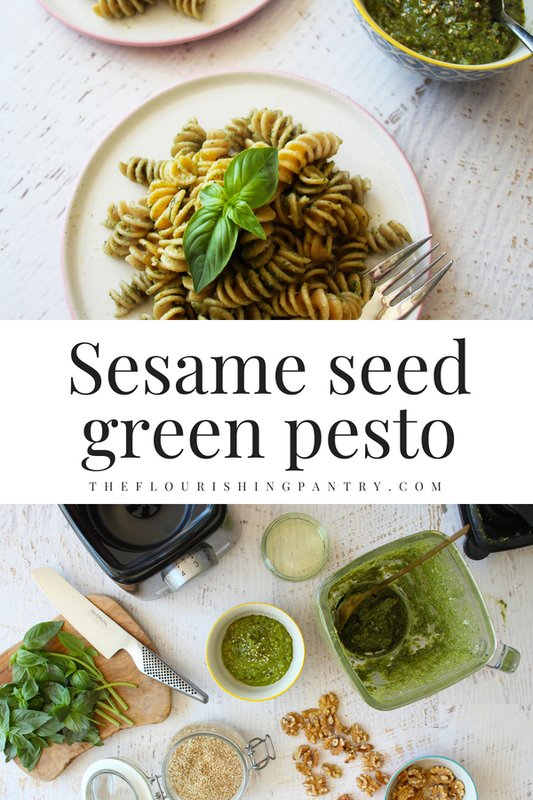 One of the suggested swaps was sesame seeds for pine nuts and making a pesto with sesame seeds was suggested by Registered Nutritionist Charlotte Stirling-Reed. So a brilliant and simple way to up your fibre intake is to make your pesto with sesame instead of pine nuts. The Magimix Power Blender is great to work with. It's got loads of different settings and the jug is a really decent size for doing big batches of things like smoothies or soups or sauces. This pesto recipe is a little bit smaller in size so it does mean you'll need to scrape down the sides occasionally to keep everything moving and get it all combined smoothly. But the spatula included is perfect for this as you can pop it through the hole in the top and give everything a little wiggle! I've since tried the Magimix Power Blender out making nice-cream (banana based vegan ice-cream like these raspberry and mint ones) and the ice-crusher function was perfect on the frozen bananas, working them down into a soft-serve consistency. I also used it on Ceri from Natural Kitchen Adventures Lemon Cashew Cheesecake. It worked like a dream, making the cheesecake topping totally creamy and smooth. It would work brilliantly on my own matcha lemon cashew cheesecake recipe too if you want to give it a try! Place the oil, lemon juice, maple syrup, tahini and crushed garlic into your Magimix Power Blender. Before you go slinging it all in: it's important to put the liquids in first at the bottom to make sure everything keeps moving and gets combined. Top the liquids with the basil and then set to speed 3 on the auto setting until your basil is completely blitzed. When combined, add the walnuts, sesame seeds, salt and pepper and process again. You may need to use the spatula to scrape down the edges and make sure the nuts are all crushed into the pesto. If the mixture is too thick add a drizzle more olive oil to keep it moving. When completely combined taste and adjust the salt, pepper or lemon juice if needed. Serve with pasta, dollop on pizza or drizzle on salad or Buddha Bowls. I also love loading up a salmon fillet with pesto across the top before grilling. Any pesto you don't use can be stored in the fridge for up to two weeks in an airtight container. Pin the image below to Pinterest to save for later! Disclaimer: I received a Magimix Power Blender in exchange for this review and the recipe which is shared on the Magimix website. I did not receive any further payment and all opinions are my own.